Following the declaration of war by the United States, more than 200 American men, unwilling to wait until US squadrons could be raised, volunteered to join the Royal Flying Corps in the summer of 1917. Amongst these men was John MacGavock Grider and Elliott White Springs who both joined 85 Squadron to fly SE.5 fighters. During his service with the RFC and the RAF, Grider kept a record of his experiences from when he joined up until his untimely death in 1918, when he was shot down over the Western Front. Before his death, Grider had made a pact with Elliott White Springs that in the event of one of them dying, the other would complete their writings. Springs went on to write this book, an amalgamation of his own recollections and Grider’s diary and correspondence. 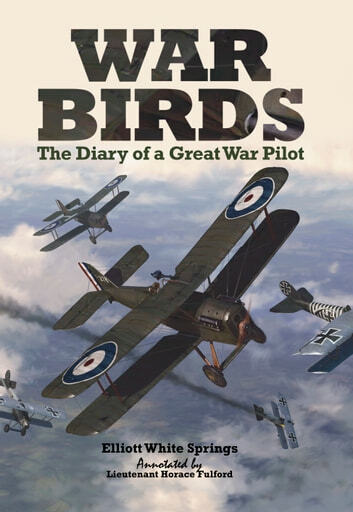 War Birds records in detail the stresses of training and the terror and elation of failure and success during combats with the enemy the First World War. This unique edition of War Birds has been produced from a copy owned by another officer from 85 Squadron, Lieutenant Horace Fulford. In his copy, Fulford made numerous handwritten annotations and stuck in a number of previously unpublished photographs – all of which have been faithfully reproduced.